This is a required senior-level course for meteorology majors, and is one of the final courses taken in the core meteorology curriculum. 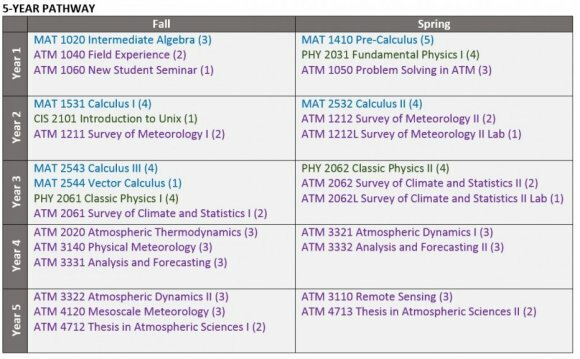 Prerequisites for the course include calculus, physical meteorology, and at least one semester of dynamic meteorology. This course focuses on providing students with an understanding of the components of the climate system, climate system dynamics, and factors that lead to changes in the climate system. Topics are presented in order of increasing complexity, beginning with the global energy balance and radiative transfer in the atmosphere. Following this, we explore: the role of the land surface in climate forcing (surface fluxes and the hydrologic cycle), global atmospheric and oceanic circulation, climate variability and its role in weather forecasting (ENSO, the NAO, and monsoons), and long-term climate forcing. The topic of climate modeling is integrated throughout the course, as students begin to work on their term projects. For example, an introduction to simple energy balance models is integrated into the discussion of the global energy balance and radiative transfer. Calculate the change in Earth's global energy balance, given a change in solar output, a change in Earth's albedo, or a change in the concentration of atmospheric greenhouse gases. Estimate a surface energy balance at a particular location given incoming solar radiation, surface albedo and information about any relevant surface features. Describe the hydrologic cycle and feedbacks associated with the cycle that may stabilize or amplify climate change. Be able to use climatology and thier understanding of global teleconnection indices (ENSO, NAO) to assist them in weather forecasting. Read, evaluate, and discuss current climate research articles regarding present and future climate change. Use a global climate model to explore a question pertinent to climatology – describe what the model does and be able to analyze the output from this model to quantify climate sensitivity to changes in forcing and identify relevant feedback mechanisms. This course features a term project where students develop a research question and run climate-modeling experiments (using simple energy-balance models, or simple 3-D models available online: EdGCM, MAGIC/SCENGEN, or the UNEP Java Climate Model). Students apply their understanding of climate dynamics in the analysis and interpretation of results. At the end of the semester, students present their results in the form of a paper and poster presentation. I wanted to develop a course that would require students to integrate not only what they had learned in my class, but concepts they have learned in other meteorology courses as well. So often, we take a 'piece-meal' approach to teaching about the atmosphere – which is necessary to understand the individual pieces. But I wanted students to begin to see the bigger picture – how each of the components of the earth system interact and feedback on one another, and how changes in one part of the system affect the whole. This is accomplished when students run modeling experiments and begin to see, firsthand, the effect of changing one aspect of the system. My other goal for this course is that students would begin to think like scientists – to develop a question and then develop a methodology for answering that question.